Kongs are widely used as therapy for prevention of boredom, separation anxiety, and other behavioral issues. Providing food and/or treat stuffed Kongs for your dogs can keep them contently busy (working) and out of trouble for long periods of time. 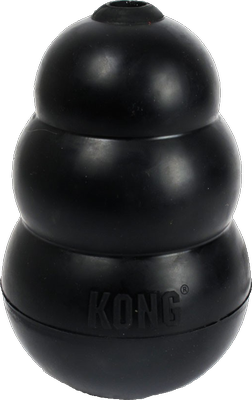 Extreme Kong is made of durable, hard rubber and is great for power chewers. No chew toy is indestructable. Chew toys should be periodically inspected for safety and discarded if necessary.